I wanted to give this award to someone who was really making a difference to the way I eat. Someone who's hard work and dedication to a particular gastronomic art gave me something special to enjoy at the table. 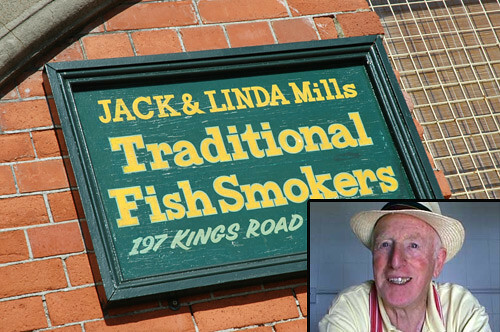 So, with all that in mind, it gives me great pleasure to award this Independent Food Award to Jack and Linda Mills of the Brighton Smokehouse in East Sussex. 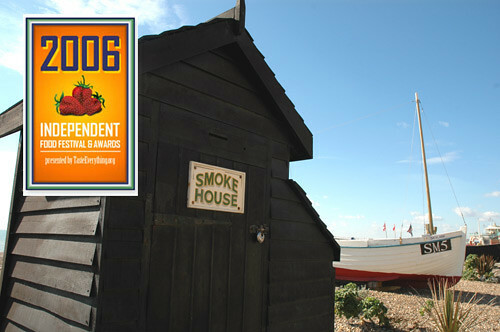 Jack tends the smokehouse near enough everyday on the seafront in Brighton. The Mill's shop, the fishmongers next door and the fisherman's museum are all that are left of the Brighton fishing fleet, moved on in the '70's for being unsightly. A bizarre reason, yes, but it was the '70's, the local council where probably hepped up on goofballs. Jack smokes mackeral, kippers and there is nothing quite like tucking into a slice of his lightly smoked salmon, tender yet firm and with a delicious layer of fat. Quite stunning on a slice of granary. Jack and Linda's place is not an anchronism. It has survived, yes, but it is indicative of the sudden clamour for artisanal food that they are busy all year round and Jack is something of a local institution. It was just my luck that I went down there today having forgotten that it was a Monday and that since there was no fishing Sunday, they were closed! My impeccable planning, as ever. I must eat something from Jack's place once a week. I'm often in Brighton with work and it makes my day strolling down to the sea front, especially on a day like today, with a chill wind and a bright blue sky. It makes me grin to see smoke puffing out of the smoker, safe in the knowledge that Jack is making me good things to eat. P.S. Once again I am guilty of some image poaching. The image of Jack is from the BBC Video Nation series. You can see Jack's video here. if that is a piece of smoked haddock i am going to be very envious all of a sudden. To think I hated it for about 20 years, and now I dream of it. I have a whole smoked Alaskan salmon vacuum sealed in my cupboard... oh it must be eaten, but when and with whom? Please? Please? Please take me there ASAP?